Situated east of the more widely recognized Society Islands such as Tahiti, Moorea and Bora Bora, the Tuamotu Archipelago comprises around 80 islands and atolls stretching northwest to southeast across the South Pacific Ocean, creating the longest chain of atolls in the world. These sand-covered, coral reef islands rise only a few feet above the waterline and are home to fewer than 20,000 inhabitants, spread out over an area the size of Western Europe. 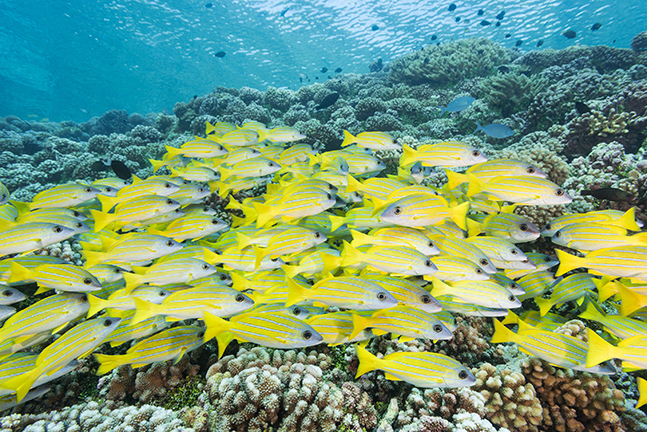 Reminiscent of the southern atolls in the Maldives, divers flock to the Tuamotus to see large schools of fish and pelagics swimming in the swift currents that flow through the passes between islands. Matthew Meier shares highlights from his adventure in Tuamotu, after visiting the archipelago on the only liveaboard operating in the area. 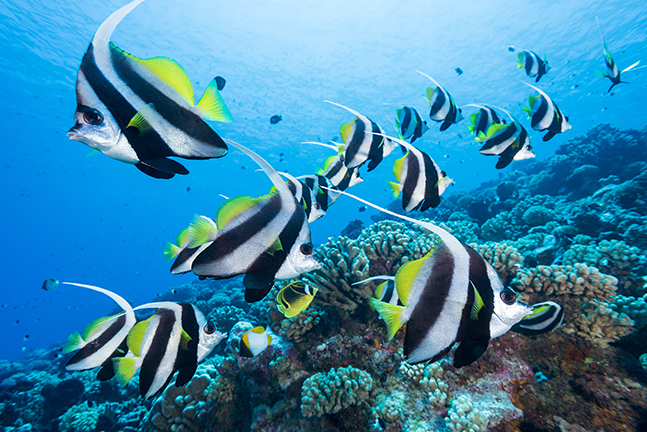 School of bannerfish over reef. Photo by Matthew Meier. 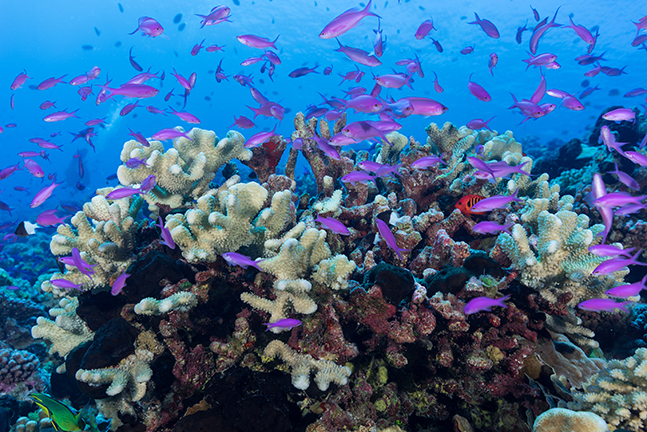 After two days of waiting and several failed attempts, Mother Nature finally rewarded divers on the liveaboard with an incoming current at the famed Tiputa Pass on Rangiroa Atoll. The skiff dropped us in open ocean just outside of the pass and we were now rocketing through the water, 100ft (30m) below the surface. Large schools of fish and gray reef sharks assembled at the mouth of the pass, hovering effortlessly in the current, while a squadron of eagle rays and two great hammerhead sharks circled another 50ft (15m) below. As we entered the pass, the bottom rose to meet us, further heightening the sensation of speed, as we whipped past grooves and channels in the rocky sea floor. In the distance, a large shape loomed and appeared to be moving in our direction. 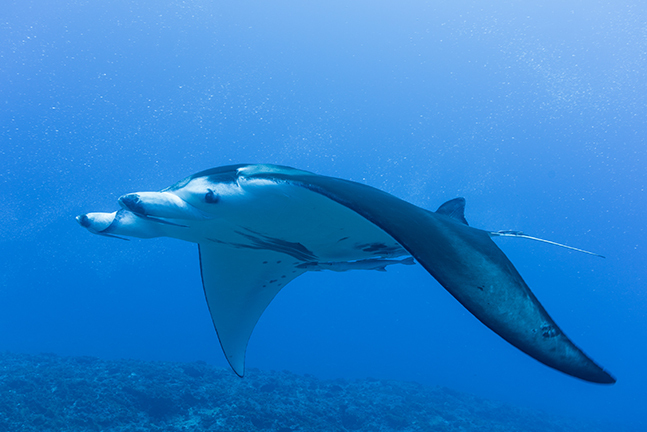 A manta ray was swimming out of the channel, pushing against the intense current with relative ease. Clambering towards the bottom, I managed to secure a reef hook and flatten myself against the rocks in hopes of minimizing my resistance to the fast-flowing water. What happened next was one of the more magical experiences of my diving career. The manta ray swam up beside me, paused and then slowly moved directly overhead, eventually getting so close that I lost sight of its wingtips through my camera. For what seemed like an eternity, I lay there mesmerized by this incredible creature, gliding effortlessly above me and then, as quickly as it appeared, it was gone. Looking back at my photos, of which there were far fewer than I imagined, the entire encounter had lasted less than a minute. Nevertheless, I was excited when I got to the surface, thinking that nothing could top my dive, only to learn that our other group of divers had experienced a close encounter with a tiger shark while watching the manta ray dance above me. 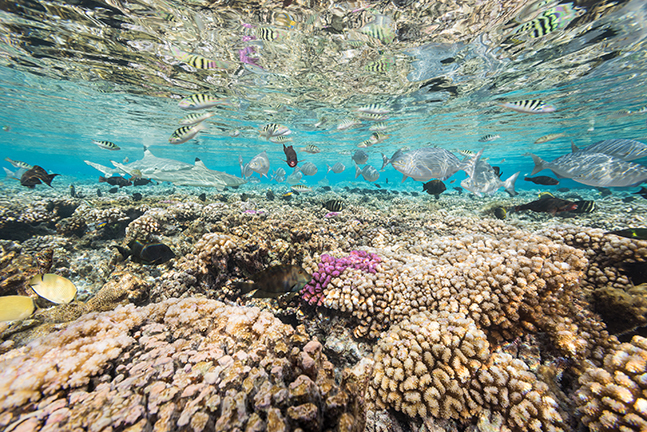 Welcome to the Tuamotus! This adrenaline-filled destination is easily reached by way of an eight-hour flight from Los Angeles to Tahiti, followed by a one-hour puddle jump to Fakarava or Rangiroa. Land-based resorts exist on both atolls, but to truly experience all of the surrounding area, I suggest an excursion on the French Polynesia Master. Operating since January 2017, she is the only liveaboard dive boat in the Tuamotus and allows for up to four dives per day, on seven- to 10-day expeditions. Built specifically for divers, this brand-new vessel offers an expansive dive deck, multiple camera tables, spacious cabins and plenty of lounge space. 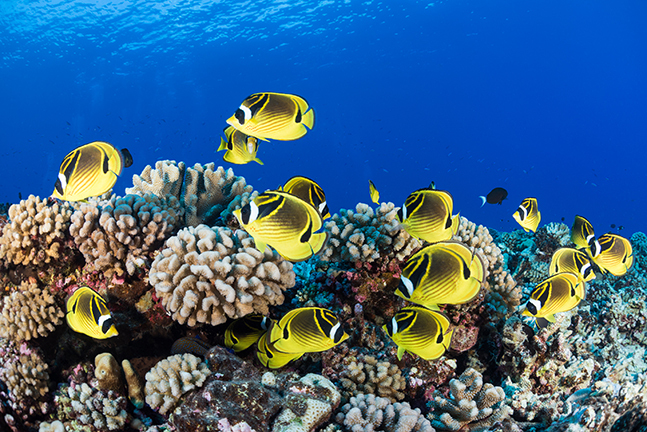 Diving in the Tuamotus is dependent on the currents and the creatures they attract, including barracudas, big-eye jacks, several species of sharks, dolphins, manta rays, eagle rays and even the occasional whale shark. 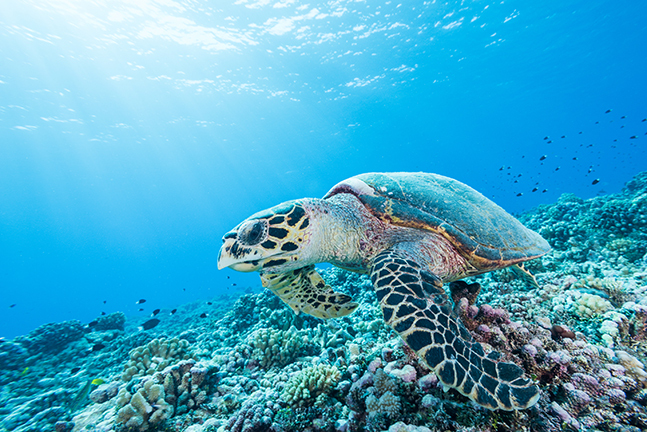 The extensive hard coral reefs support immense schools of reef fish as well as solitary animals such as the humphead wrasse, titan triggerfish and multiple species of sea turtles. Of course, there are also invertebrates, crustaceans and other macro critters to see on the reefs. However, except for the relative calm at certain spots inside the lagoon, the currents make it difficult to stay stationary and observe or attempt to photograph the little stuff. This is a wide-angle, pelagic, schooling fish, riding-the-current type of destination, and travelers hoping to spend their time planted in one spot, scouring the reef for interesting critters, should likely head elsewhere. Sharks. I have heard stories of the famed wall of sharks when I first visited French Polynesia over a decade ago. Thrilling tales of strong currents, wild rides and sharks too numerous to count while diving at places like Fakarava and Rangiroa. I am here to tell you that the walls do exist, and they are not confined to simply those two atolls. 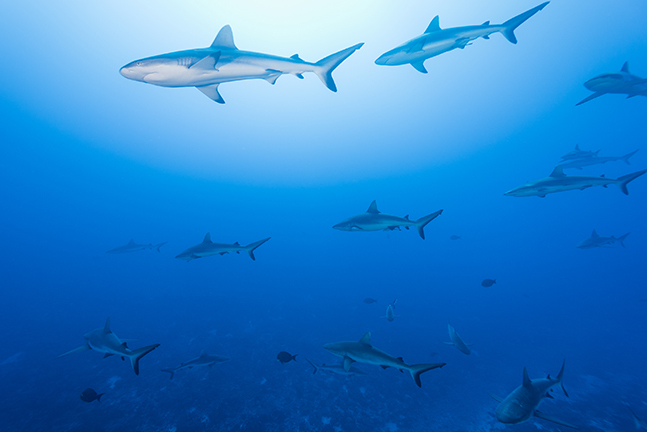 Gray reef sharks gather with the incoming current and use their streamlined bodies to seemingly hover in the water column. We saw this phenomenon at numerous atolls during our liveaboard adventure; and the stronger the current, the more sharks it seemed to attract. Photographing this spectacle requires patience, a little luck and a reef hook, so you can stay anchored against the racing water. Camera in hand or not, this exhilarating experience is not to be missed. 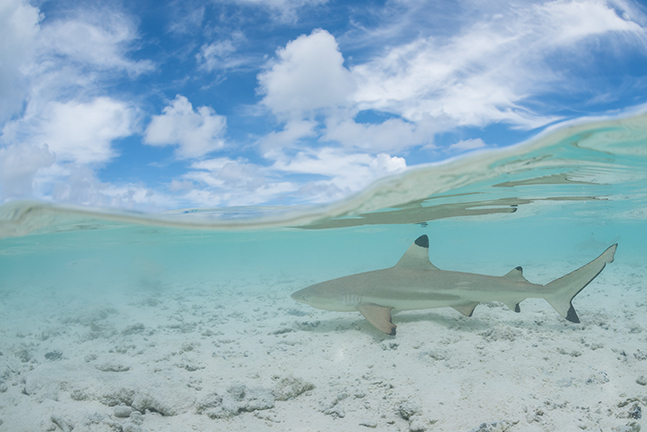 During the months of May and June, large numbers of hammerhead sharks may be found around Fakarava and Rangiroa. Sharks are revered in French Polynesian culture, and historical lore tells of a shark constellation in the stars. Our local guide told stories from his childhood of swimming with small sharks that had been caught in fish traps by the diminishing tide. He said that sharks are seen as gods, messengers to the spirit world and even as an intermediary between humans and death. They represent the warrior spirit, and he explained that to become a chief, one had to first swim with sharks. Grouper. 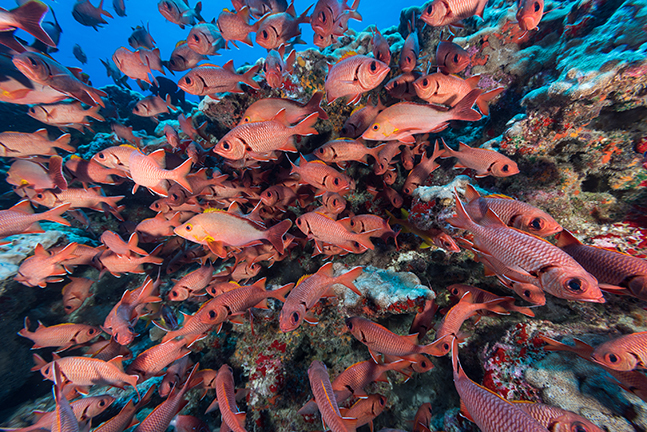 As the hammerhead sharks disperse, large numbers of camouflage grouper gather at the south pass on Fakarava Atoll in what may be the largest known spawning aggregation of big reef fish. Often numbering in the tens of thousands, the groupers assemble to spawn with the full moon in late June and early July. During the spawning, the preoccupied fish become oblivious prey for the hundreds of sharks that congregate to take advantage of an easy meal. French Polynesia has fairly strict guidelines regulating the number of divers per guide, as well as the allowable depth you may descend based on your certification level. 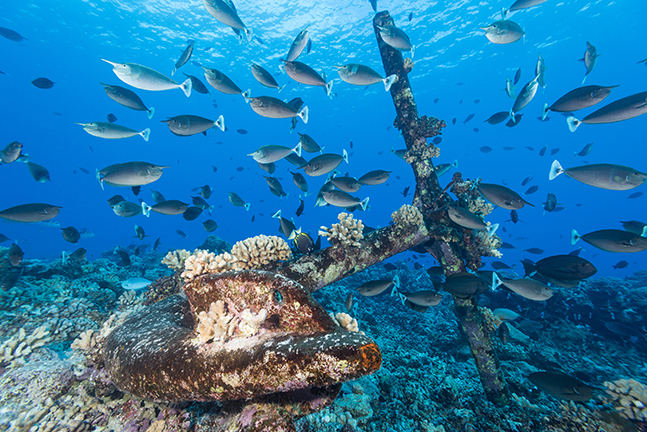 Since many of the dive sites exceed the 60ft (18m) limit for open water divers, an advanced dive certification is recommended, due to the depth and the strong currents of the Tuamotus. Diving is accomplished off small inflatable skiffs in groups of four to six per guide. Typically, there is less than a five-minute ride from the liveaboard to most dive sites, and guests enter the water via a backwards roll on the ocean side of the pass. If there is an incoming current, the group will descend to the mouth of the pass and hook in to stay in place while watching the schools of fish, sharks and other pelagics in the water column. Depth and air supply govern how long divers may stay and watch the show before the guide instructs them to unhook and ride the current through the pass and into the lagoon. Safety stops are typically completed while floating in the blue under the guide’s surface marker buoy. Outer reefs are more easily explored with an outgoing current, as long as divers are careful not to stray too close to the pass and get swept out to sea. During our 10-day trek across the archipelago, we were often the only boat in sight and nearly always the only divers on a reef. It was easy to envision oneself as a small speck floating on this big blue planet, surrounded by open ocean, with only a small sliver of land serving as protection against the forces of nature. The remote beauty of the surroundings seemed to have been stolen straight off a postcard at times. There were numerous uninhabited, palm tree-covered islands, surrounded by shallow coral reefs and turquoise waters, with blue skies and puffy white clouds overhead. In between dives, it was often possible to walk the beaches of these beautiful islands or snorkel in the shallow waters just offshore. Those of us with a camera did our best to replicate iconic over/under images with the reef below, palm trees above and blacktip reef sharks in the foreground. I was only partially successful in this venture and will simply have to return in an attempt to perfect this shot, among others. If vacation time allows, I highly recommend spending extra days in French Polynesia before or after your time on the liveaboard. You can opt to do nothing at all, relaxing in a hammock on a tropical beach, or you can enjoy the numerous activities available on the various islands, designed to keep you entertained. Rangiroa’s blue lagoon. I chose to spend two days on Rangiroa after departing the boat and had an incredible experience exploring the blue lagoon. 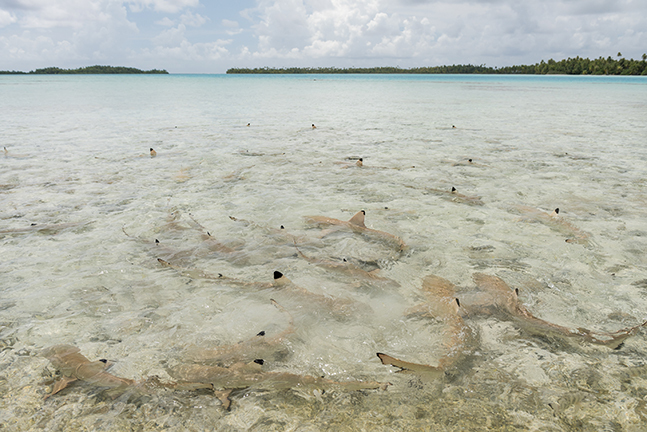 This shallow body of water is on the western edge of the atoll and is home to dozens of juvenile blacktip reef sharks and stingrays. Local independent operators and selected hotels offer day tours to the lagoon, allowing guests to snorkel with the sharks and rays, explore remote palm tree-lined beaches and indulge themselves with a barbeque on the sand. The sharks swim in packs and come right up to the shoreline, often with their dorsal fins exposed. Wading into the water causes the sharks to initially retreat, but by keeping still, with a little patience, they will be circling your ankles in no time. 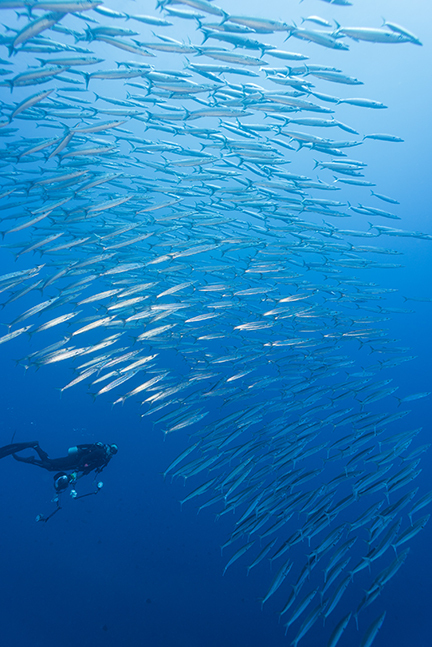 These interactions create lasting memories and fantastic photo opportunities, both above and below the water’s surface. Tahiti’s tiger shark dive. For the truly adventurous, a two-tank tiger shark dive is offered off the island of Tahiti for an up-close look at these magnificent animals. 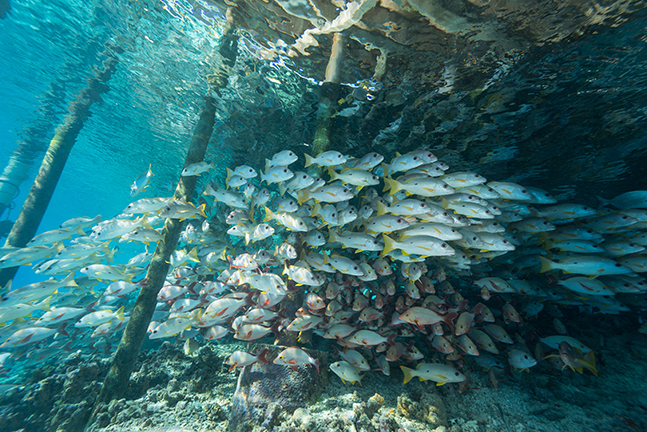 Fish heads are put in the water to attract the tiger sharks and the bait will also often lure in gray reef sharks, blacktip reef sharks, whitetip reef sharks, lemon sharks and nurse sharks, along with a host of reef fish looking for a free meal. This is one of only a few places on this planet where you can reliably interact with tiger sharks. The dives are available year-round but are not conducted daily, so be sure to check the schedule and reserve your space in advance. Humpback whales. During the months of June through December, with the peak times being mid-August through October, it is also possible to snorkel with humpback whales off Tahiti and Moorea. Half-day tours depart daily in the morning and early afternoon, with drinks and snacks provided. The whales migrate from Antarctica to the warm, shallow waters every year to give birth and raise their young. My visit was in early March, and I regrettably missed the whales, but this is an encounter that is very high up on my bucket list and one for which I hope to return and experience. Polynesian Night. Several resorts offer a glimpse into the native culture with performances of traditional music and dancing. Often called Polynesian Night, these exhibitions take place after an evening feast of local favorite foods. Both men and women dress in traditional costumes while they perform ceremonial dances that have been passed down through generations. Children also participate as they learn the traditions from their elders and perpetuate their heritage. Towards the end of the evening, guests from the audience attempt to dance along with the entertainers as they are invited to join in the festivities. The presentation makes for a fun evening and frequently produces colorful stories to share with loved ones back home. Tahitian black pearl farms. French Polynesia is famous for its Tahitian black pearls, and a visit to an oyster farm is a must. Several operations offer tours so that guests can witness the production process firsthand and browse their selection of finished pearls. Grown in shallow lagoons with good water flow, baby oysters are raised in pens for three years until they are large enough to seed for the growth of pearls. The oysters are temporarily removed from the water, and a specially-trained technician carefully seeds each one by hand. A small, perfectly round fragment of shell and the black mantle of a nicely colored oyster are used to seed future pearls, before the oysters are placed back in the ocean. After 45 days, the seeded oysters are checked to make sure the grafts placed inside have taken. Out of every 100 seeded oysters, roughly 70 are successful, 25 produce usable pearls, but only the remaining five are perfectly round. Once a seed has been accepted, it takes another two years before the pearl is ready to harvest. Oysters that produce a good colored, round pearl are reseeded with larger starter fragments in hopes of creating a larger pearl two more years down the line. A productive oyster generates a maximum of three pearls in its lifetime; on rare occasions, four pearls are possible. 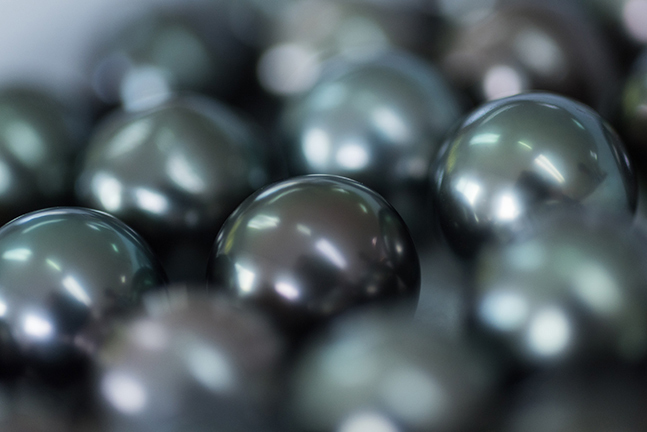 Understandably, due to the limited number produced, the extensive labor involved and the many years required for their creation, large and perfectly round black pearls are a highly-prized and expensive commodity. The author would like to thank Master Liveaboards (masterliveaboards.com) and the Hotel Kia Ora Resort & Spa (rangiroalagoon.com) for their generosity as the gracious hosts on this adventure; Air Tahiti (airtahiti.com) and Air Tahiti Nui (airtahitinui.com) for their assistance with flights; Fluid Dive Center Tahiti (fluidtahiti.com) for their offer of a tiger shark dive; and Scubapro (scubapro.com) and Blue Abyss Photo (blueabyssphoto.com) for their assistance with underwater dive and photo gear. Matthew Meier is a professional underwater photographer and travel writer based in San Diego, California, USA. To see more of his work and to order photo prints, please visit: matthewmeierphoto.com.